Is bigger always better? Countering the trend towards smaller digital screens is the largest and most expensive digital billboard in Times Square, New York. It is tough to see it all in a single glance – the new screen is eight stories tall and nearly as long as a football field, spanning the entire block from 45th to 46th Streets on Broadway. With nearly 24 million LED pixels, the display has better resolution than any top-of-the-line TV set. Going along with the bigger screen is an equally big price – $2.5 million for four weeks. And the first renter of the space is equally big – Google will be the exclusive advertiser with a campaign that runs through the end of January. Speaking of big, more than 300,000 pedestrians enter the Times Square area each day while another 115,000 drivers/passengers pass through the area by car and bus. The location is a prime tourist destination and photo opportunity. Even more people see the scene when the area is part of big events such as the New Year’s Eve celebration. More than 1.5 million impressions are generated each day in Times Square. Billboards are gaining new traction with marketers as new social media and mobile tactics allow viewers to engage with marketing such as broadcasting their faces on billboards or download coupons after walking past an ad. 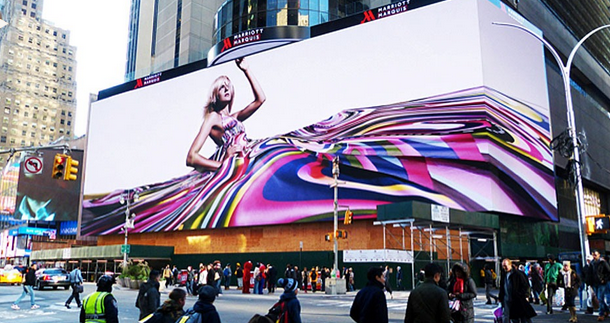 Spending on outdoor advertising in the U.S. is expected to be $7.2 billion. Discuss the use of billboards in a media mix. When is it a good tactic, and not a good tactic? Also show the Web site for Outdoor Advertising Association of America to gain additional insights into different forms of outdoor ads: http://www.oaaa.org. Have students use their laptops to bring up various billboards in Times Square. Discuss the elements that make the billboards effective and memorable. Divide students into teams. Have each team select a product or company and design a billboard for a digital display.